Let's Talk Interiors: You’ve been living in your house for 8 months or even 28 years and the whole house needs an update. Overwhelming to many, but at the same time the hope of turning it from a dark cave into a sparkling jewel can be exciting! Where do you start and whom do you call? Interior Designer, Mary Ellen McKee-Curtis, can offer solutions ranging from ©Simplified Design Plans to whole house color schemes, furniture selection and window treatments. With 20+ years of experience in interior design and a Bachelor of Arts degree in Home Economics / Clothing and Textile Design, Mary Ellen established Let's Talk Interiors in 1999. 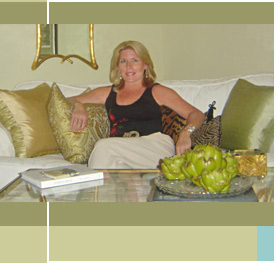 Having serviced clients in Beverly, Danvers, Marblehead, Melrose, Newburyport, Reading, Salem, Topsfield, Winchester, and Winthrop, Massachusetts, her projects have ranged from space-planning and color selection for off-site vacation homes to redesigning urban lofts and even the redecoration of funeral homes. Mary Ellen Curtis has the design skills and vision to transform any room into a dynamic, sophisticated space. One area of a room that I address is the focal wall: this is the first wall you see when you enter a space, and it sets the tone for the rest of the room. It should have a major impact on the viewer and welcome you in to see more. It could be as simple as a sofa set against a window treatment with contrasting colors and textures or a beautiful painting positioned to complement the furniture. My goal is to give every room an expression of personality.